This tour includes visits to remote areas that will involve longer walks over sometimes rough surfaces. Hotels in major centres are first class/deluxe while those in the countryside will generally be more rustic, yet clean and comfortable. 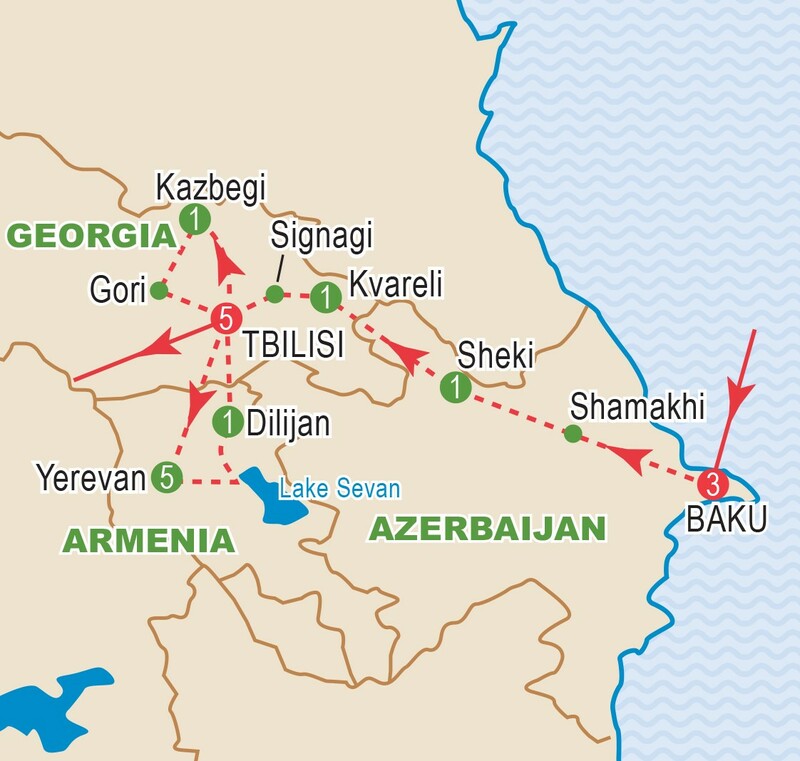 This is a journey of exploration to the Caucasus and more specifically to three small nations: Azerbaijan, Georgia and Armenia. Located between the Black and Caspian Seas, they were former Soviet Republics. Since winning their independence in 1991, they have prospered and joined the world. The Silk Road, connecting Asia and Europe, crossed through these lands, providing them with a long and storied history as well as a sense of belonging. Being at the crossroads, they are neither European nor Asian, but something uniquely different. Why visit the Caucasus? This journey offers insights of a very different world, one with magnificent mountain scenery and a long religious and trading history. Christianity was brought here during the 1st century AD by the Apostles. Armenia was the first nation to adopt Christianity as their national religion in the 4th century. 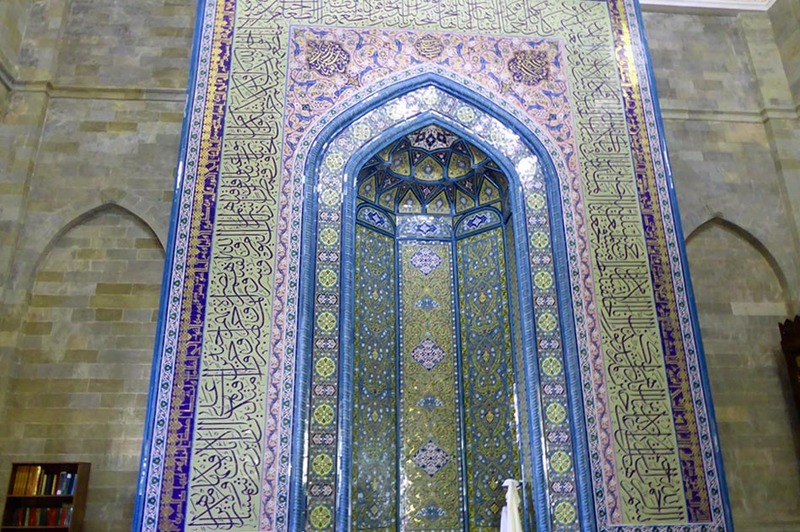 Everywhere we go, we will find religious relics: Pagan, Zoroastrian, Christian and Islamic. It is small wonder then that their respective histories developed with this strong faith and their monuments to the past take the form of religious stone buildings and statues. Virtually every important sight and beautiful landscape is marked by an historic structure. This journey will take us to the major centres such as Baku, Tbilisi and Yerevan, where we will find very comfortable accommodations and services. We will also venture into the countryside to experience life as it is today, and where our accommodations while still very comfortable, will be a little more rustic. Group size is strictly limited and we anticipate that the group will fill quickly. Be sure to reserve your places now. Tour members gather in Toronto for the overnight flights to Baku, Azerbaijan. Our morning begins with a visit to Mountain Park and the Martyrs’ Alley Memorial with its panoramic view over Baku. Continue to the walled medieval Old Town (UNESCO) for a walking excursion. 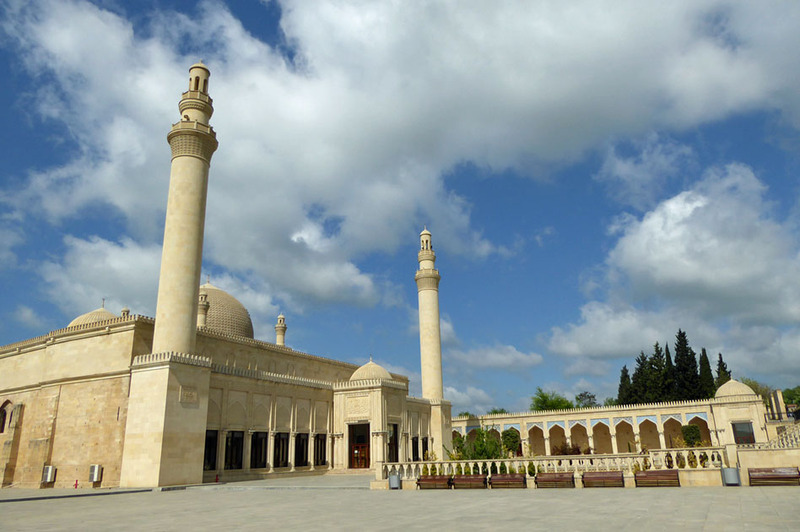 Highlights include the Gyz Galasi or Maiden Tower (the oldest building in Baku), ancient mosques, the Market Square and Shirvanshahs’ Palace (UNESCO – dates from the 15th century). Following lunch and some free time in the old quarter, we will visit Atashgah, the recreated temple dedicated to the Land of Fires, based on ancient Zorastrian and Hindu beliefs. Enjoy a welcome dinner in the Caravanserai Restaurant with a lively folklore show. This morning we will venture to Gobustan National Historical - Artist Preserve (UNESCO), an open-air museum littered with Neolithic rock drawings, an outstanding collection of more than 6,000 engravings dating back some 40,000 years which is noted for its amazing landscapes. After lunch by the Caspian, we will visit the Azerbaijan Carpet Museum, with exquisite examples dating back to the 16th Century. Balance of day at leisure to explore the city. Drive into the foothills of the Greater Caucasus crossing Muganly Pass and follow the old Silk Road route. 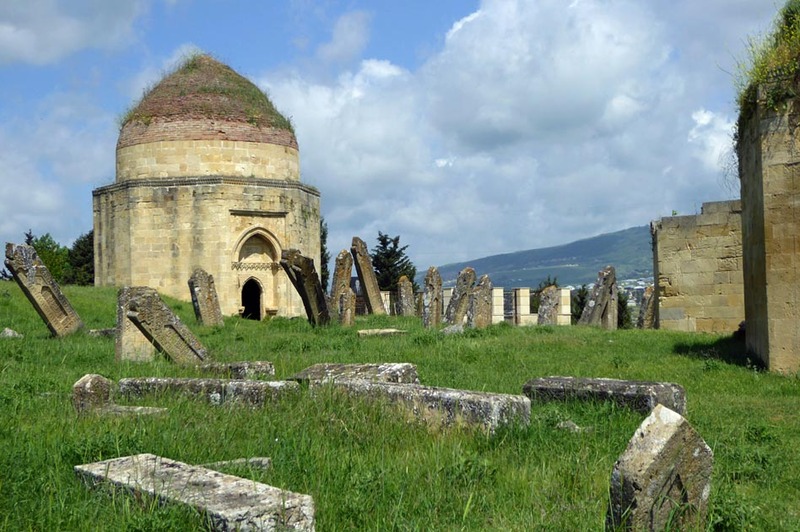 At Shamakhi we visit the historic Mosque Juma (Friday) and Yeddi Gumbez (Seven Domes) Royal Mausoleum, burial place of the Shirvan Khanate. Sheki, one of the oldest Azerbaijan towns, has a medieval fortress, Sheki Khans’ Palace, and a local handicrafts workshop. In the village of Kish, founded around 3000BC, we visit the historic church and the caravanserai (or inn) from earlier times. This morning we cross into Georgia and enter the Kakheti region, Georgia’s famous wine district and a picturesque land dotted with fine mature vineyards. Visit Khareba Winery, with a wine cellar carved into the rock, to sample some wine. Explore the fortified 16th century Gremi Complex, including the Church of the Archangels, a three-story castle, a bell tower museum and a wine cellar. Visit the Tsinandali Estate before we arrive at our hotel, which overlooks Ilia Lake and two rivers. Our day begins in the Old Town, with its winding roads, alleys and wooden balconies. Highlights include Metekhi Church (overlooking the river), the Sulphur Baths (Abanotubani), the cable car ride to the Narikala Fortress (impressive ruins overlooking the Old Town and the Mtkvari River), Sioni Cathedral, the heart of Georgian Orthodoxy, and the Anchiskhati Church (ancient style of Georgian church). After lunch, we ride the Funicular for spectacular views of the city. The balance of the day will be free with time to explore the Old Quarter and Rustaveli, the main street which is the heart of the city, lined with elegant Renaissance and neoclassical buildings. The simple chapel of Jvari (6th century), located on a high hill, is a perfect example of early Georgian Christian architecture. 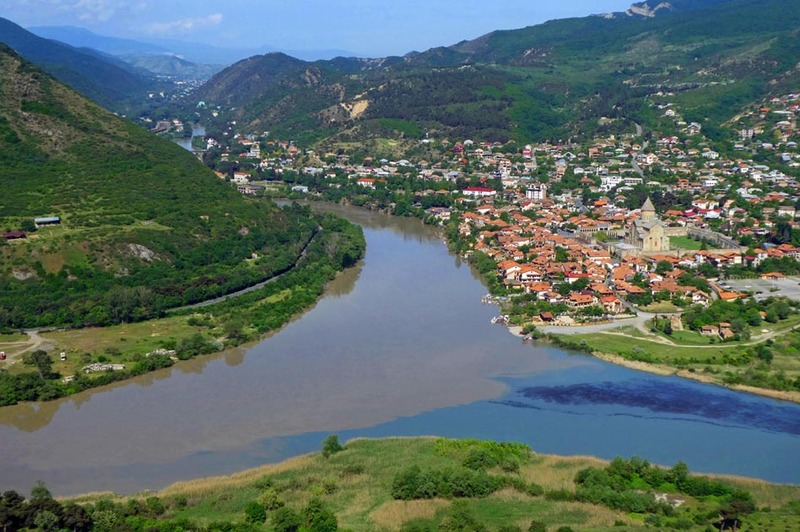 Mtskheta (UNESCO: from 2000 BC), at the junction of Rivers Aragvi and Mtkvari, was the capital of the Georgian Kingdom of Iberia. 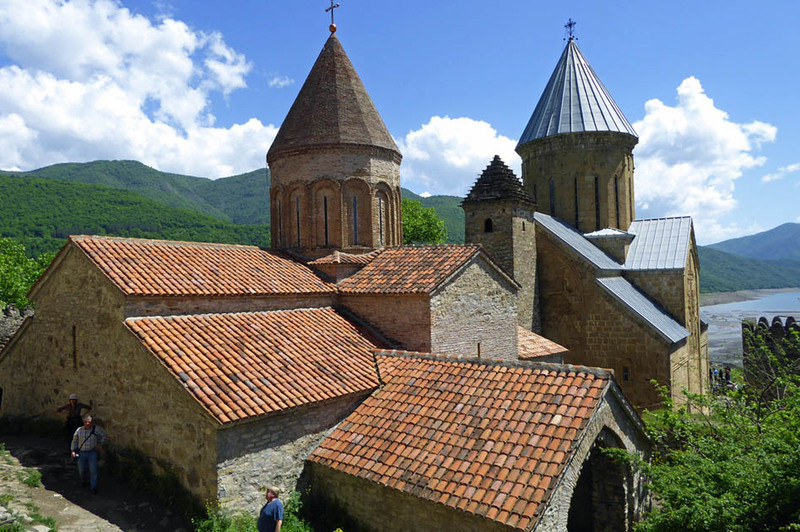 Visit the 11th century Svetitsikhoveli Cathedral, Georgia’s largest and the burial place of royalty. Drive over the Jvari Pass (2,395 m), stopping near Gudauri, the highest village on the road before arriving in Kazbegi (1,700 m), a picturesque village overshadowed by Mount Kazbek (5,047 m). Continue in 4x4s to the 14th century Tsminda Sameba Trinity Church, for fine views of the snow-capped mountains. Enjoy the mountain scenery en route Ananuri Fortress, overlooking the Aragvi Valley and Zhinvali Reservoir. Uplistsikhe, or ‘the Lord's Citadel’, is a cave town hewn into the living rock. 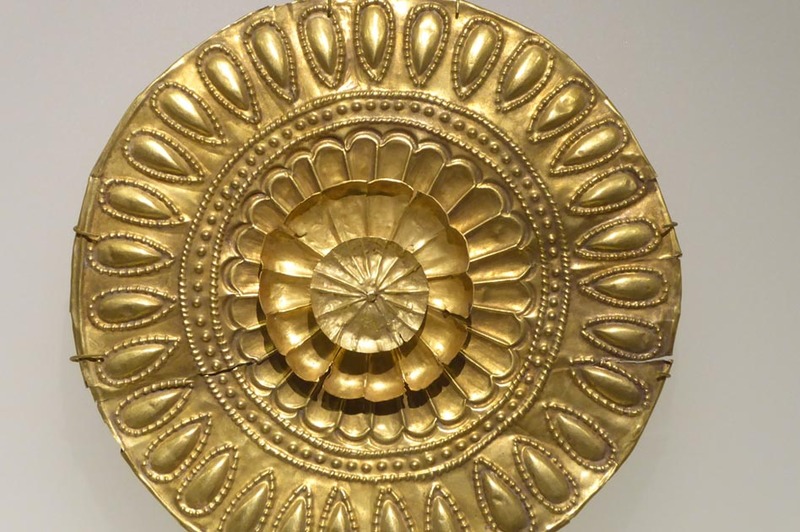 Dating from the 7th century BC, the centre was a strategic point on the ancient Silk Road. We will see a large central hall for pagan rituals, living rooms and a 9th century church. Continue to Gori, the birthplace of Stalin (1879). Visit Stalin’s Museum, which includes the original wooden hut, Stalin’s birthplace, and Stalin’s private railway car. Later we continue back into Tbilisi. Departing early, we make our way to the Armenian border where we meet our Armenian Guide and coach. 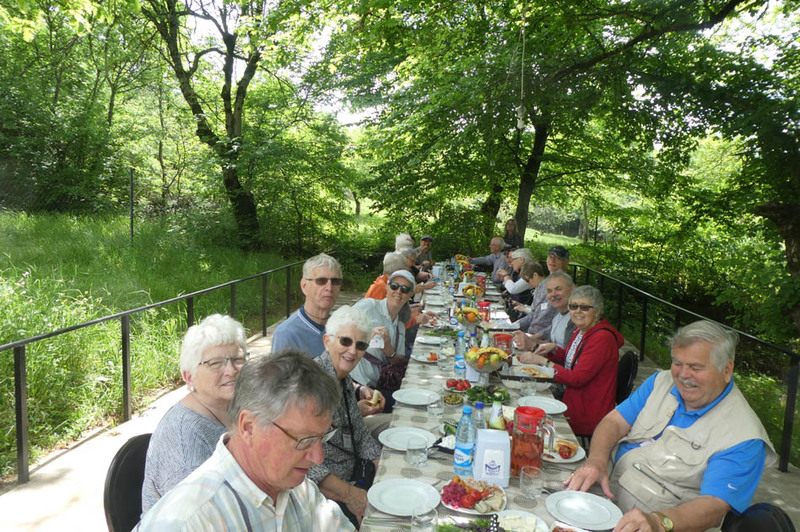 Set on a high plateau surrounded steep forest-grown slopes, is the monastery of Hagh Pat (UNESCO site), Following lunch, we continue through the heart of Armenia to the nation’s capital and largest city, Yerevan. Modern Yerevan was redesigned and rebuilt in the early part of the 20th Century with a tremendous amount of development since the end of the Soviet era. This “pink city” was constructed using a pink tufa stone, quarried locally. This morning we will discover the city, both ancient and modern as we tour Republic Square, the Park Cascade (with its amazing sculptures), the remarkable Matenadaran Library (with over 17000 rare manuscripts) and the moving Genocide Memorial. 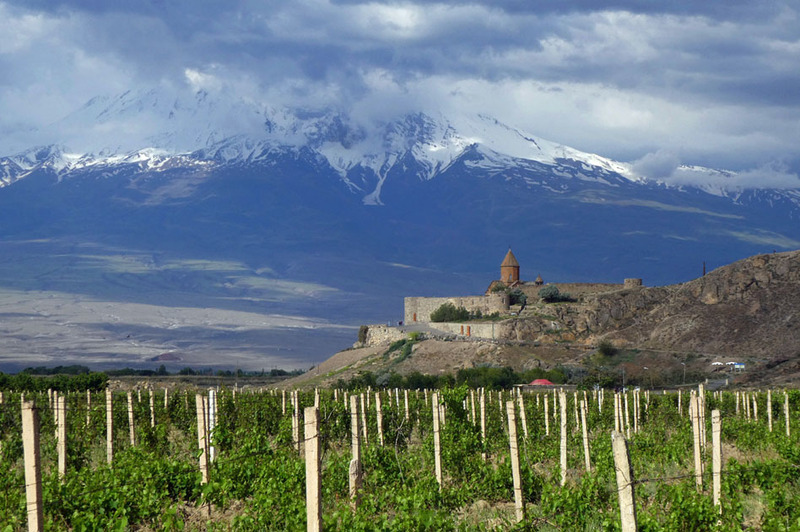 Following lunch at a selected restaurant, we will visit the State History Museum (noted for its relics from the Stone Age to recent times) and one of the producers of the local Ararat brandy and wine. Other highlights include busy Mashtoc Avenue and the House of Opera and Ballet. Etchmiadzin dates from 117AD and was once the capital of Armenia. It was here that St Gregory the Illuminator had a vision of Christ descending to earth. This morning visit to the remains of the Zvartnots Cathedral (UNESCO) - once the world’s largest round church, built in 7th century. Continue to the Mother See of Holy Echmiadzin (UNESCO), the “religious capital” and the seat of the Supreme Patriarch of the Armenian Orthodox Church. Dating from 303 AD, the cathedral is a masterpiece in Armenian classical architecture. In the attached Museum of Etchmiadzin we will see Christian relics of special note – a piece of Noah’s ark, wood from Christ’s Cross and the Roman spear used to pierce Christ on the cross. 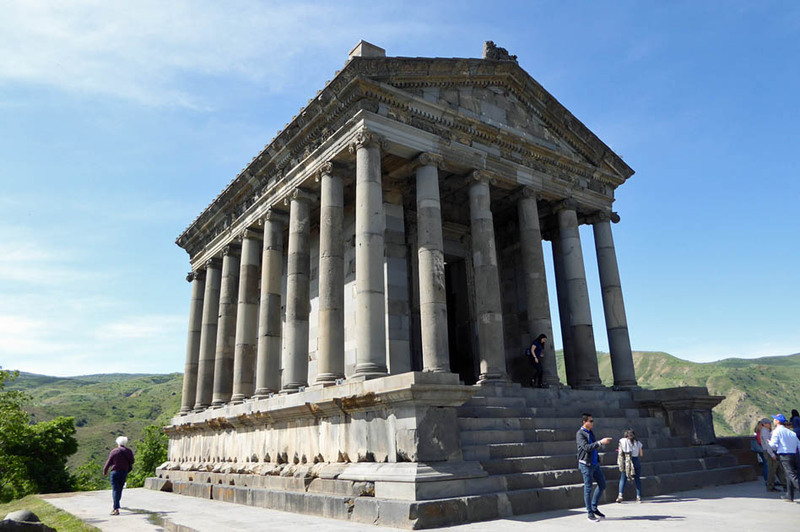 Garni is Armenia’s last pagan temple and is dedicated to Mihr, the God of Truth and Light. This classical Hellenistic first century structure sits high in the mountains overlooking the valley below. Following lunch, proceed to the UNESCO site of Geghard, an ancient cave monastery and the peak of Armenian medieval architecture. Help make “lavash”, the Armenian national bread, and enjoy its flavours. Very thin and cooked in a “tonir”, or ground oven, it is an UNESCO Intangible Heritage. In Yerevan, we will have free time in Vernissage, an open market, before enjoying our dinner of typical Armenian food and entertainment. Heading south from Yerevan brings us to Khor Virap Monastery a place of pilgrimage for Armenians from all over the world. This is the closest point to Mount Ararat from which we can enjoy stunning views of the Biblical mountain. Enjoy the picturesque countryside as we continue to Areni village for a wine tasting and a visit to Noravanq Cave where the world’s oldest leather shoe was found. Following lunch we continue to Vayots Dzor and visit Noravank (13th C), one of the most splendid monuments of medieval Armenia, surrounded by towering peaks and red cliffs of the Amagha Gorge This evening we are back in Yerevan for a final evening. Enjoy a completely free day back in Georgian capital, home to variety of excellent museums and excellent shopping in the Old Quarter. This evening we have arranged a special Farewell Dinner with entertainment at a local restaurant. All too soon, our journey draws to a close as we catch our flights back to Canada. Airfares from other gateways are available on request. Airfares and air carriers are subject to change and will be confirmed prior to final payment. Refer to inclusive features for details. Tour price is based on sharing a twin or double-bedded room at hotels. Prices are based on a minimum 20 members and on rates, taxes and fees effective July, 2018 and are subject to change due to factors beyond our control. Prices DO NOT INCLUDE the cost of insurance which is available and is highly recommended. Premiums vary with the cost, length of the trip, and the traveller’s age. For passengers up to and including 74 years on departure date, premiums will range from $278 to $415 pp plus applicable taxes. Cost supplements for travellers aged 75-85 will range from $196 to $405 pp plus applicable taxes. This insurance is effective from the date of purchase and carries limitations on pre-existing medical conditions. Please discuss your insurance coverage prior to booking. Refer to terms and conditions for more details.